Osmar Barba Ibanez has been rewarded once again for his stellar season with FC Seoul, being named in the K-League Best XI for the 2016 season. Osmar captained his FC Seoul team to their sixth league championship. His impressive performance made him an MVP candidate in the K-League. Osmar came up short in the MVP race in the end. He finished in second place with 39 votes, seven votes fewer than Gwangju FC striker Jung Jo-gook, who topped the league with 20 goals. 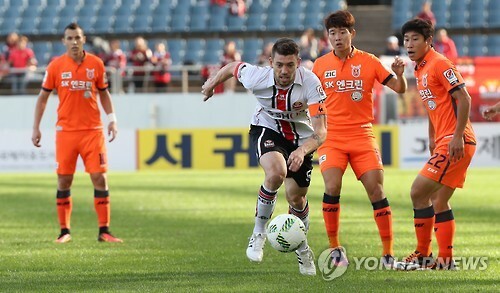 The 28-year-old is the first Spaniard to play in the top-flight K League Classic. He joined Seoul on a three-year deal from Thai champions Buriram United in 2014. In 2015, Osmar became the first foreign player to complete the K League Classic season without missing a single game, while helping FC Seoul to the Korean Football Association (FA) Cup title. He earned 100 K League caps in just 910 days, the fastest among foreign field players in the league. Although he failed to win the top individual honor, Osmar can still walk away a happy man. FC Seoul are currently on the verge of a league-cup double. They will play the FA Cup final against the Suwon Samsung Bluewings later this month. Osmar is the first foreigner to serve as captain in FC Seoul’s history. Although many local clubs have tended not to appoint foreign captains due to communication issues, he was an exception. Osmar said he is willing to wear the captain’s armband next season, but he will not be disappointed even if a teammate takes over the role. Although FC Seoul claimed the league title for the first time since 2012, Osmar said there are things to improve. FC Seoul won the championship Sunday after beating Jeonbuk Hyundai Motors 1-0. Seoul and Jeonbuk entered the final showdown tied at 67 points but since Jeonbuk had the tiebreaking edge in goals scored, Seoul had to win to take the championship. For Osmar, it was a pity that his team crashed out of the Asian Football Confederation (AFC) Champions League. They were eliminated by Jeonbuk in the semifinals. Osmar started as center back for FC Seoul, but after head coach Hwang Sun-hong — who took the helm in June after Choi Yong-soo left for Chinese club Jiangsu Suning — started to use a back four system, he mainly played as defensive midfielder. © 2016 Yonhap News | This article first appeared on 10 November 2016 in Yonhap News.